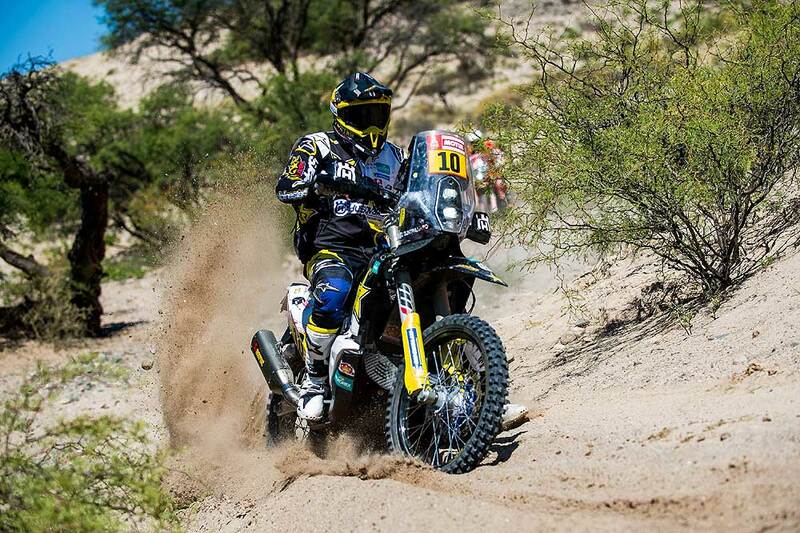 Making the best of a challenging day in this year’s Dakar Rally, Rockstar Energy Husqvarna Factory Racing teammates Pablo Quintanilla and Andrew Short have both finished inside the top six in SS10 of the event. With Pablo claiming a strong runner-up position, Andrew enjoyed his best stage result to date bringing his FR 450 Rally machine home in sixth position. Featuring highly demanding navigation, the day’s timed special was a real test for all competitors’ skills and stamina. Making use of his vast experience, Pablo Quintanilla posted the second fastest time for the day. In doing so he climbed to 9th in the event’s overall standings. With four more demanding stages to go, the two-time Rally World Champion is less than 30 minutes behind a provisional top six final result. "It was a really tough day," said Pablo Quintanilla. "Even before its start we knew it would be a tricky stage in terms of navigation, with lots of off-piste section in camel grass terrain. There were also many rivers and some of them were in parallel to the right tracks. Following my results from the previous stage in Bolivia I had a good starting position so focused on my navigation and tried my best to make up some of the time lost. I didn’t want to push over the limit, as I knew it was possible to make a mistake. This strategy worked in my favour and we managed to get a good stage result." For Andrew Short, SS10 was proof of the progress the Husqvarna Factory rally rookie has made during this year’s event. Making light work of a demanding stage, the acclaimed US racer secured the first top six Dakar stage result of his career and is now placed 19th in the provisional overall standings. "It was an up and down stage for me but I am more than satisfied with the result," Andrew Short reported. "I was fast in some parts of the stage and then in others I had to slow down and pay more attention on my navigation. There were some parts of the stage that you couldn’t actually see where you were going. I rode by myself for the first part of the stage and that was a good practise for me." "Then in the second part, I caught the leading riders who had got lost and I managed to stay with them. I just kept it pinned while trying not to make mistakes. I also had a big crash at one point, but luckily it was all good and I managed to get going again. I’m still really excited with the way things are going so far. I learn a lot and start to know how to be fast while also making sure I follow the right tracks." With the first part of the second and final marathon stage starting today, there is still a long way to go in this year’s Dakar Rally. On Wednesday competitors will contest a 280km timed special on their way from Belén to the marathon bivouac in Fiambalá.